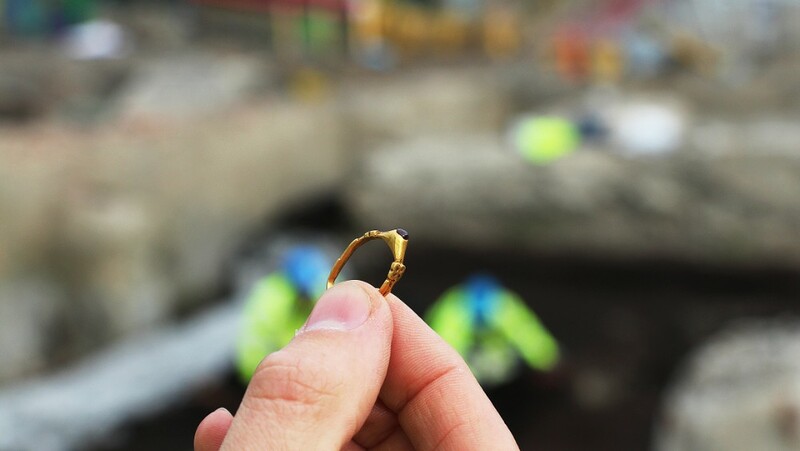 Archaeologists have found an ancient gold ring in the mud in Bjørvika, downtown Oslo. The ring has been hidden since Queen Eufemias era in the early 1300s. The 23-karat gold ring decorated with garnet has been lying in the mud over 700 years. Recently, archaeologist Line Hovd at the Norwegian Institute for Cultural Heritage Research (NIKU) discovered it. Archaeologists are working in the Bjørvika area to ensure cultural heritage before the large-scale construction of the new Follo Line starts. Project manager Egil Lindhart Bauer at NIKU is very pleased to have been able to search the historical area. – The ring is one of 20 rings from the period ever found in Oslo. We have found many other exciting objects here as well, but this is probably the most exciting, he says. – It might have been an engagement ring. There are traces of a dextrarum iunctio motif, i.e. two hands meet. This can be a symbol of a covenant. The quality may reveal that the gold ring belonged to someone of higher range. – This was an expensive object and probably did not belong to “common” people. It shows signs of being well used, Bauer concludes. After lying below the feet of Oslo citizens through many centuries, it is time to put it out on display. The ring is moved to the Museum of Cultural History in Oslo, placed side by side with other irreplaceable jewelry from the Middle Ages. Professor of archeology Marianne Vedeler says the discovery is very important. – I cannot even remember the last time such a ring was discovered in Oslo. If it had been found one year ago, it could have been part of the ongoing jewelry exhibition at Museum of Cultural History. Until the next jewelry exhibition, the “Bjørvika Ring” will be examined. Meanwhile, the treasure hunt in Bjørvika continues throughout the winter of 2016. More jewelry from the Middle Ages are on display in the exhibition “Take It Personally” at the Museum of Cultural History in Oslo. Very interesting! I would love to see all the jewelry they have recovered!